I’m not even sure where to begin. What a trip! Literally. I wasn’t sure what to expect when I got to Japan. I knew there would be a language barrier, but we quickly also found out the subway/metro system is quite complicated. We did get used to it after a couple days though, thank goodness! As soon as I arrived to the apartment very late on Wednesday evening (Feb 18), I went to bed. It had been a long travel day of many hours. Thursday morning we woke up early, headed to a traditional breakfast place for noodles (you order your meal from a vending machine, receive a small ticket, then hand that to the chef), and then headed to the Tokyo Marathon Expo. I wanted to get this over with on the first day the expo was open. The expo was really easy and organized, as far as picking up your bib, shirt, chip and info. Once you exit that area, it became a very loud convention hall full of craziness! It was like going to a live auction with people yelling out things, handing out things, just pure chaos. It was almost too much for me. But I came upon an area where they were embroidering your name (or whatever you wanted in a limited amount of characters) on the sleeve of your participant shirt. It was only 500 yen, which was a little less than $5 USD, for my name in Japanese characters, so I said why not! After an hour of perusing the rest of the vendors and waiting for my shirt to be done, we finally left. After a couple of full days of sightseeing, I tried to rest my legs on Saturday afternoon and not go too far away from where we were staying and get ready for the race. We found some pizza places nearby, so I was all set to get my carb load the night before. That evening we decided that we wanted to get the pizza delivered so we didn’t have to go anywhere. Brilliant! Then all of a sudden it occurred to us that we would not be able to order the pizza over the phone because we didn’t speak a lick of Japanese. Ha! So, my friend Shin was trying to get a hold of us to meet up, so we just asked him to come over to order the pizza for us. He called a Dominos and we were all set! And, I might add, it was quite delicious. 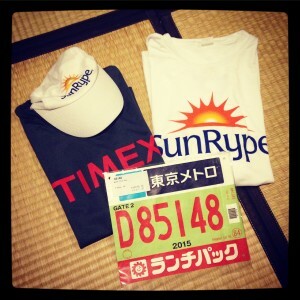 After my pizza, I drank some fluids, laid out all my race gear, and went to bed early. It wasn’t too hard to go to bed earlier because our days were jam packed of getting up early and 13 hours of sightseeing, so it made it easier to put on the pjs and get in bed. 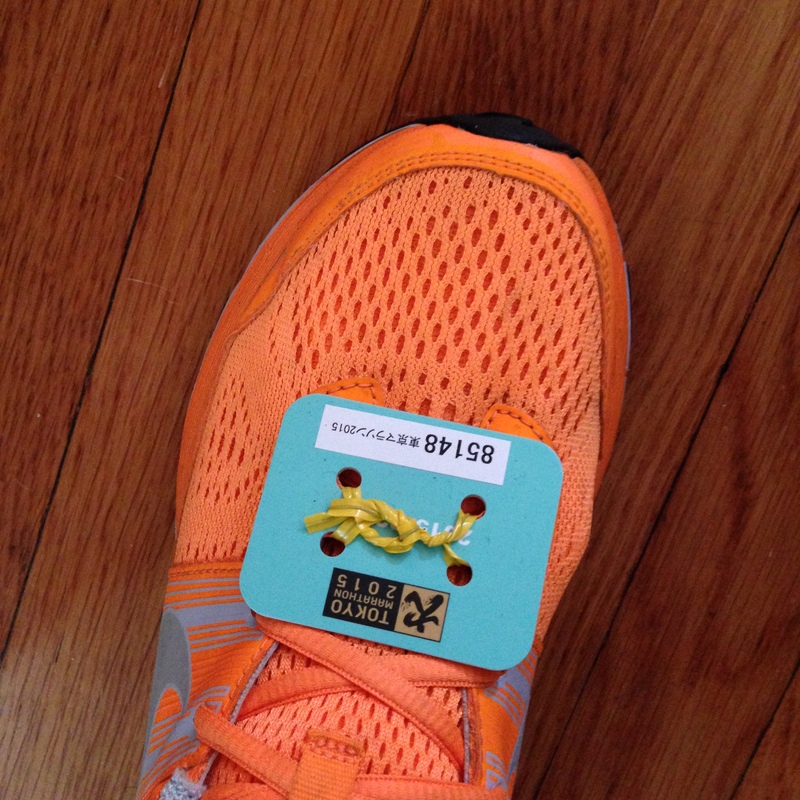 Twist ties to hold the timing chip in place – will this stay on my shoe?? I woke up early, as usual, and decided to just get up and put my clothes on, put my timing chip on my shoe with twist ties (I was a little nervous these wouldn’t hold), and got ready. The race didn’t start until 9:10am so I was happy to “sleep in” a little and get up around 6:30. 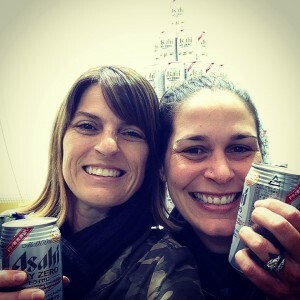 I had coordinated with my friend Nicole (who was on this Japanese adventure with me) on where to meet at the end of the race at the #7 balloon in the family meeting area, but I also got her squared away with meeting up with Shin in the morning to go to spots along the course so she could see me run by. So, I had a piece of cold pizza, grabbed my “banana in a bag”, and all my stuff in my gear check bag and headed out the door around 7:20 to get to the JR (Japanese Rail) that took about 30 minutes to get to the starting area in Shinjuku. As I entered the Tamachi station near our apartment, I didn’t see any other runners, but as my train continued, several runners got on at each stop along the way. I started to notice all the runners were wearing leggings or running tights. I was wearing shorts. I started to think maybe I should have packed tights. But I never run in tights…I’ll be fine! 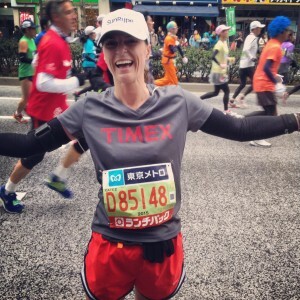 As we exited at Shinjuku, runners had packed the trains and I knew I was in the right place. We just followed one another and made our way out of the station. Officers/volunteers were holding signs telling us which way to go, which was super helpful even though you couldn’t really get lost by following all the runners. I finally had to turn right because I was in Corral D and it was in a different direction than most letters. As I turned onto that street, I noticed we had to walk down into an area that was filled with so many people in lines. As I approached, I saw that we all had to go through security lines with metal detectors and they searched our gear bags. I had forgotten they were on “high alert” with their security, but it didn’t take too long. That was a first though! After I got through this line, it got a little confusing. Luckily, I saw a volunteer that had a sign on his shirt that said “I speak English”. Thank goodness! So, I asked him where to go and it made better sense. 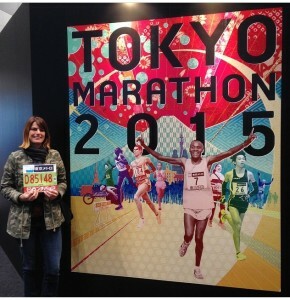 I arrived early and with 35,000 runners I was glad I did. There were announcements being made that told us what time we had to have our gear in the trucks and what time we had to be in our corrals. It was a little stressful. I also knew I needed to get in a porta potty line at some point, so I threw my bag to the gear truck and found my way up the stairs to my corral area. Along the way, I found another section of porta potties and the lines were MUCH shorter, so I grabbed a spot. 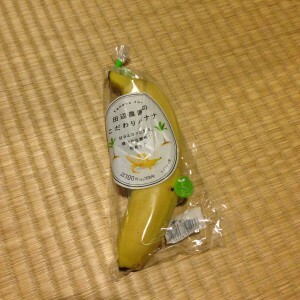 While waiting, I tried to open my “banana in a bag” and was having trouble so I asked the guy next to me to help. Even two of us had a hard time. 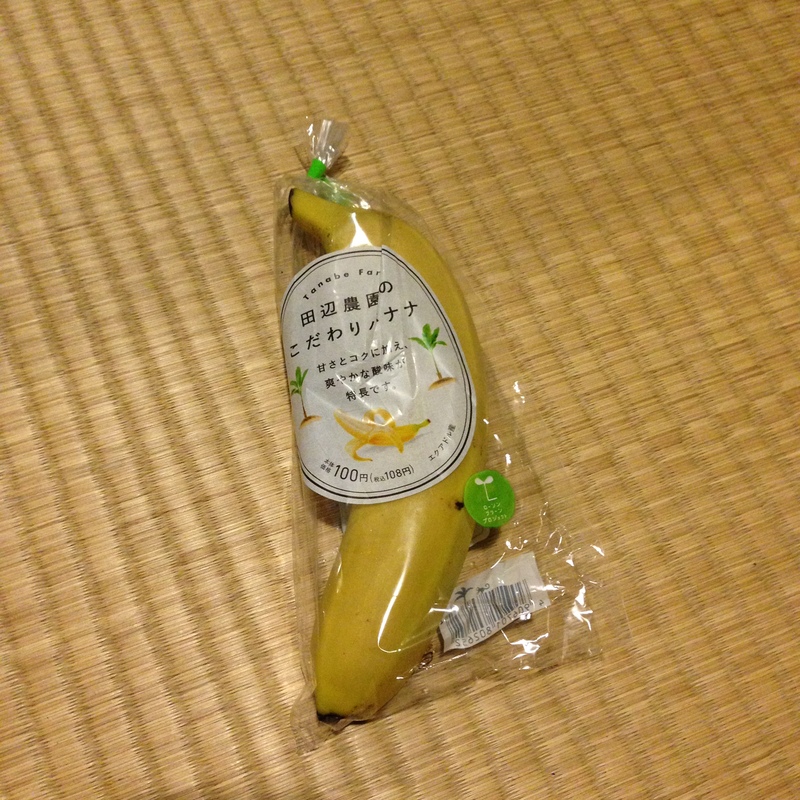 I don’t know why they package single bananas in plastic. I ate my banana and my Kind bar and walked to the corral. I got in the corral at about 8:30 and it was quite chilly. Many runners were wearing ponchos or extra layers to stay warm, but I decided to not deal with all of it and just got in with just my short sleeve shirt, arm warmers and shorts. While standing in the 40+ degree drizzly conditions, a guy from Detroit, a gal from Florida (@krissycakes13), and a German who lives in San Jose all surrounded me. What a weird coincidence that all of these people from the US are standing right next to me?! We all chatted while shivering and doing little “I’m cold” dances in place. The next 40 minutes actually went by fairly quickly. I was a little bummed to hear from the guy from Detroit that he doesn’t get the race jitters or butterflies anymore. After telling him this was my 18th marathon, he said that after 18 was when he didn’t feel those jitters anymore. So I asked why he still runs them and he pretty much said he’s just addicted now. It was a little disappointing to me and I hope I don’t ever feel that way about running these races. It may drive Clint (the boyfriend) crazy that I get all stressed and nervous about running another marathon, but that’s one of the things I love about it. It’s part of the process and what keeps me going and wanting to run more. 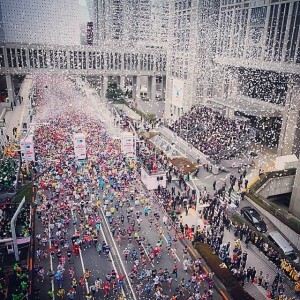 After some music and announcements, there was an explosion of confetti that flew over the top of us to start the race! It was so exciting! 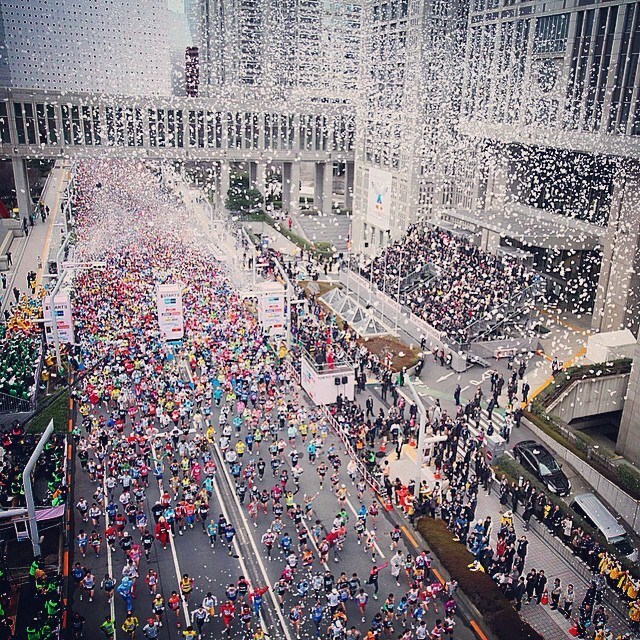 I’ve never been at the start of a marathon that had confetti flying everywhere! And we were off! It took a few minutes to get to the start line, but as I did I noticed the confetti was in little white heart shapes and it made me smile. As I continued to run, I was just in awe. I really couldn’t believe I was running through the streets of Tokyo, with all the enormous buildings with colorful signs on them. I just couldn’t get over it! I started crying about a mile in because it was just so exciting to me. I felt like this solo American running in a sea of Japanese runners. When you run a race in the US, you see so much diversity in the crowds. Hair colors, skin colors, body types, tattoos, etc. 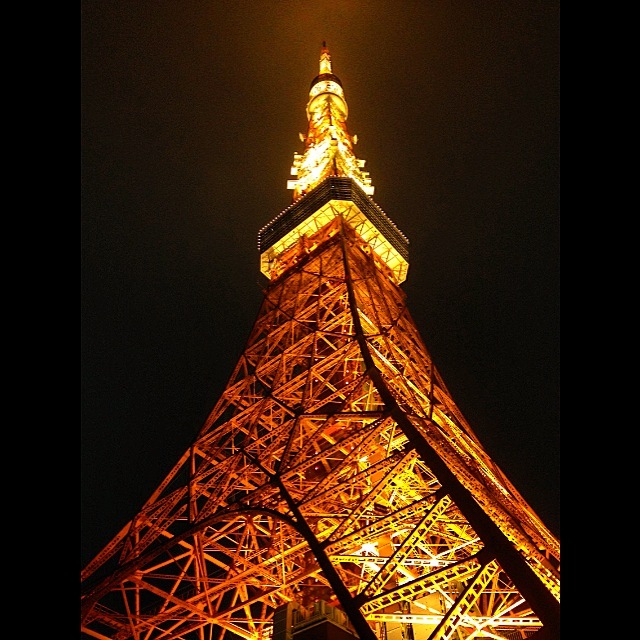 But in Japan, everyone looks the same – dark hair and short (not to be stereotypical). It’s really bizarre. There were, however, many runners wearing costumes and funny hats. I ran without ever putting my headphones in. I wore it just in case, but I just had a great time listening to everything. I couldn’t understand what the spectators were cheering, but it didn’t really matter. It was pretty awesome to hear. I felt good, I was running well, and I just kept up my pace even though my watch was bouncing all over with what my actual pace was. Aid stations were frequent and well organized. Porta potty areas were extremely organized with signs telling you where to turn off the course with arrows and men/women signs. It was so cool to see how different this was as compared to other races internationally (definitely much different from Paris). Periodically, aid stations would have tomatoes and I loved them! They were delicious! The sport drink was called Pocari Sweat and although it’s a funny name, it was pretty tasty. I spotted Nicole and Shin around the 7 mile mark and stopped for a quick photo. That was awesome! The course has a few long stretches that turn around and you run on the other side of the street. At times, you could see some of the elites or at least some of the really fast runners on the other side of the street. I saw American Lauren Kleppin (Asics Mammoth Track Club Athlete) out there running in pink. As I kept running and was nearing the end of the race, I noticed the kilometers and miles weren’t matching up on my watch. I was so confused. I basically started to think I could PR and BQ because I was approaching the 26.2 with a really great time. But it just didn’t seem right. How could this be? Well, this all started to screw with my head and I couldn’t stop thinking about it. And then, as I hit 26.2 on my watch, I had a time of 3:34! So awesome…except this wasn’t really accurate as I kept running another 2+ miles. With 1k left to run, I spotted Nicole and Shin again! I was so happy that I just ran this entire race and felt great! 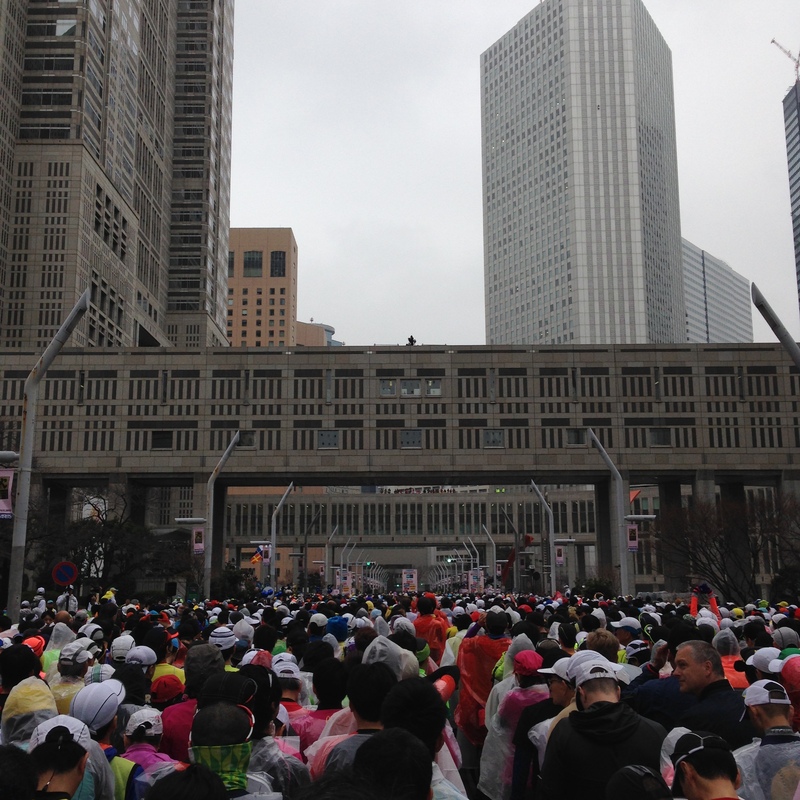 I turned left going into the Tokyo Big Sight building and saw the finish was near. 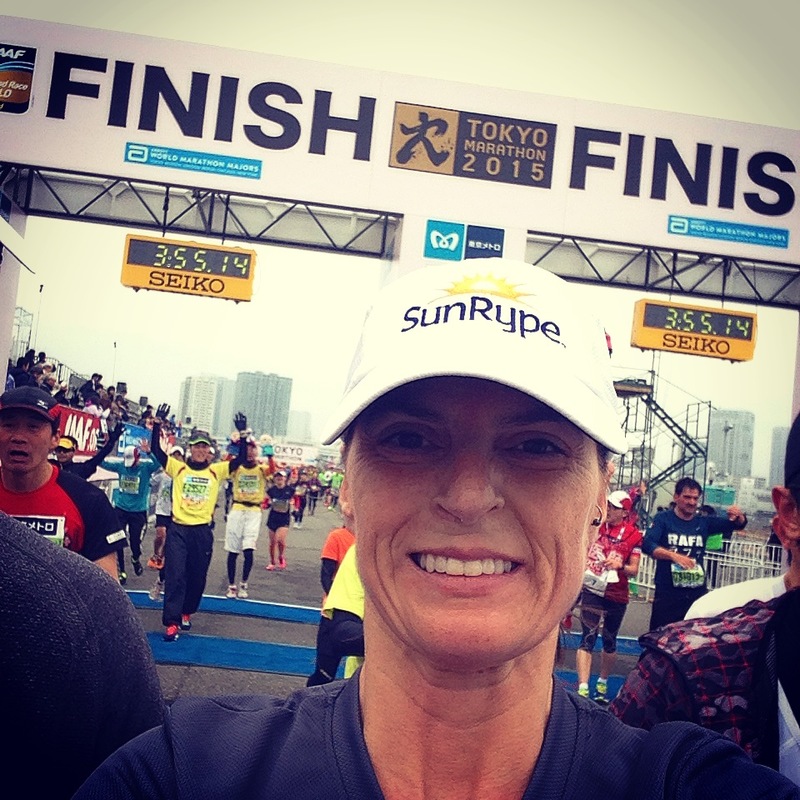 I crossed the finish line with an official time of 3:51. I was pretty darn happy with that with so many runners on the course. At about the 36k mark, we had to go up and over a bridge and the road narrowed and we were all crammed in, so it was tough to go super fast in this area. The crowd of runners never really thinned out, but I did have enough space around me. 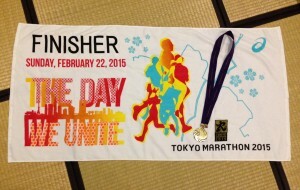 After we crossed the finish line, we received our medal and a finisher towel, which was quite nice and large. We were then directed through the area to get our water and food and then to the halls that had our gear check bags. This was amazing to see! 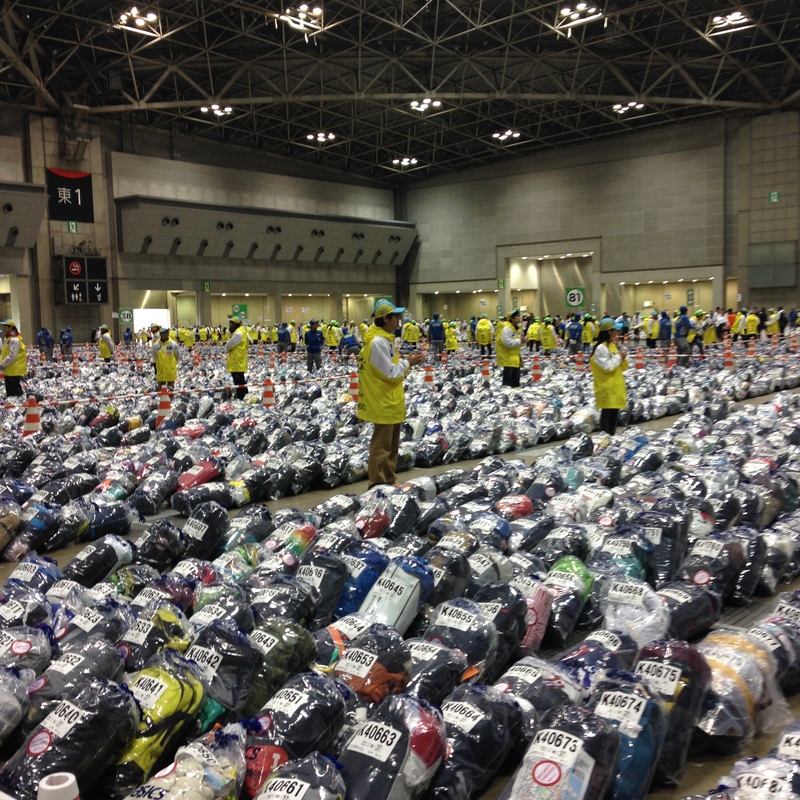 They had all our bags in numerical order (remember, there were 35,000 people running this race) in different sections and they were so quick to find our bags for us. Not only that, all the other volunteers hanging out in the areas were cheering us on and saying congratulations! After this area, we were directed to the “dressing areas” which were open areas for the men to change in the convention hall and they had more private areas for the women. I just threw on my pants and a shirt and was good to go. I got in line for my official finisher photo complete with a wreath headband, got in line for a large tomato to eat over tarp they laid out, and then headed out to the family meeting area. 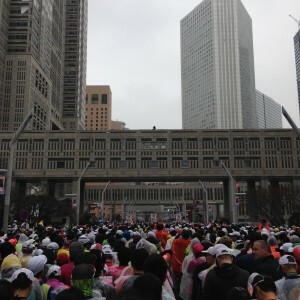 Official numbers for the race were 35,797 total entrants (Male: 27,966/Female: 7,831) and 30,509 from Japan and 5,288 traveling from abroad. After seeing the total female count made it more clear why I barely saw any lady runners out there. That was so strange. Once I found Nicole and Shin in the family meeting area, we headed out into the chaos and crowds of family members trying to get in to see their runners. I just wanted to eat something at this point because it had been over an hour and I just needed something more than SunRype fruit bars and a Pure Protein bar I had on me. So we wandered looking for something. I was kind of hoping for a warm beverage, like hot cocoa, but lines into places just seemed ridiculous, so we ended up making our way (a long way) to a metro station and headed back to our apartment. I got showered and changed and had some leftover pizza. We then made our way to the Tokyo Tower so I could see it at night. We then ended up having a late dinner there and I had some kind of rice bowl with pork. For anyone who wants to run an international race, this by far was one of the best races I’ve run. I would encourage you to try to get into this race. I don’t know how I got in this year, but I feel so lucky I did. It was a once in a lifetime opportunity and I am so happy I was able to make it happen and go. 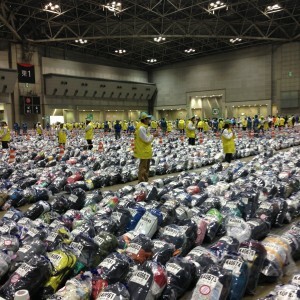 Those Japanese know how to organize races! It was done so well and they are just amazing! Oh, and this was my 4th World Marathon Major with London and NY left to run. It was definitely very exciting to check this race off my list! Sayonara for now! This entry was posted in Uncategorized and tagged international marathon, Japan, marathon, Tokyo, Tokyo Marathon by amy. Bookmark the permalink. I found your blog via Shiawase life- so fun to read other recaps of the Tokyo Marathon! Here is mine if you are interested. I too had way more mileage on my Garmin 26.2 but understandable. What a fun, fun race and experience. Congratulations to you on a strong race! Thanks for reading my blog! Sorry for the late response. I just now went through all my spam and saw your replies. For some reason they weren’t emailed to me like there usually are. WOW!! 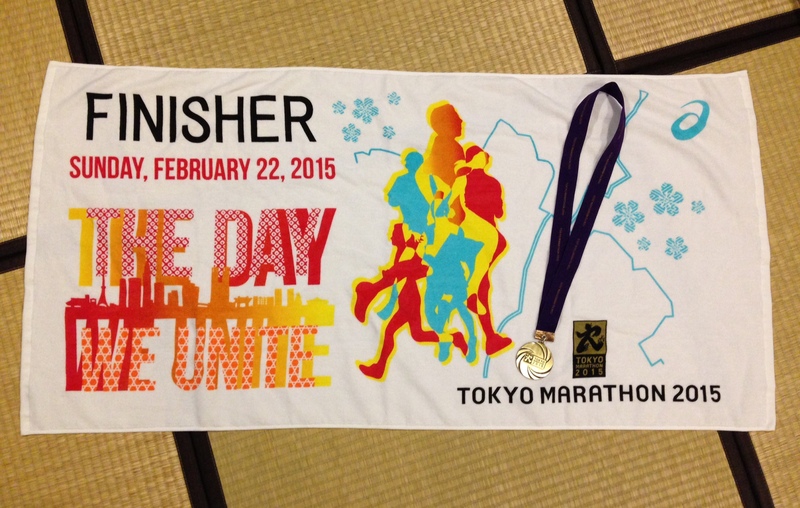 I had no idea about the number of female finishers!!! Also really interesting stats about how few women there were. Do you think its a cultural thing, where running just isn’t as popular there for women? Because in the US its the other way around…It was the same scenario at the Berlin marathon too though- very few women comparatively. I kind of wonder if it’s a cultural thing. Fitness and running has become so popular here in the US…maybe it’s just not that way in Japan or other Asian countries? ?